Savory breakfast dishes are appearing on restaurant menus to incorporate traditionally later-in-the-day ingredients into breakfast items in a fresh start-of-the-day way. The notion that different flavors along the sweet and savory spectrum are ‘supposed to be’ enjoyed at different points in the day is tired. 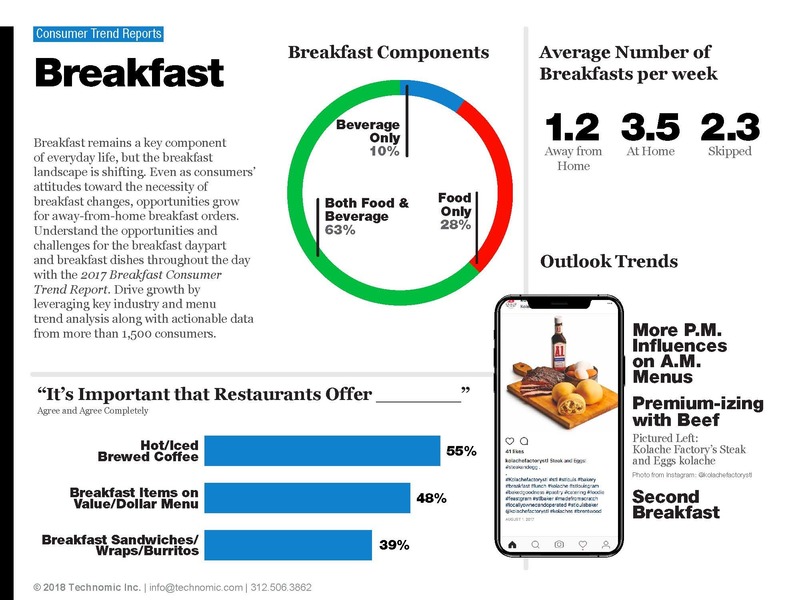 It seems both restaurant owners and guests are starting to agree: 26 percent of consumers say they enjoy eating foods that are associated with lunch or dinner for breakfast. The rising popularity in healthy eating and low-sugar diets means going savory instead of sweet at breakfast time also has health benefits for diners. With enough culinary creativity, any traditionally sweet menu item can get a savory makeover. We're serving up some menu inspiration with mouth-watering savory breakfast ideas from real restaurants around the world. Was it Picasso who said, “Donuts are the ultimate blank canvas?” If he didn’t, he should have. A traditionally sweet early-day treat, specialty doughnut shops like Holy Donut of Portland, ME and Union Square Donuts of Somerville, MA, are delighting diners with savory toppings like bacon piled high on their doughnuts. Hi-Lo Diner of Minneapolis, MN is an original 1957 Fodero Diner that traveled from Gibsonia, Pennsylvania, its current home. In keeping with its retro-fun-time feel, the 75-seat diner has a rotating menu of what they’ve dubbed Hi-Tops, which are made-to-order fried doughnuts topped with sweet or savory ingredients. Their best seller is the Gary Coop’er: a doughnut topped with buttermilk fried chicken, country gravy, and a maple-bourbon syrup. The Notorious P.I.G. Hi-Top comes with pulled pork, one sunny side up egg, black bean and corn salsa, and sour cream. Doughnuts offer diners even more ways to make things savory and increase their DBI (Daily Bacon Intake). Examples include Portland, OR’s Voodoo Donuts’ Bacon Maple Bar, a raised yeast doughnut with maple frosting and bacon on top and Cardigan Donuts in Minneapolis offers a bacon-jam filled Bismarck topped with candied bacon. Though popular egg-based menu items like omelettes, benedicts, and quiches have long involved veggies, more ingredients from the garden are appearing on menus earlier in the day and are well on their way to becoming a breakfast staple. One salad-for-breakfast trendsetter is Los Angeles based Kismet, whose options for breakfast salads include sweet potato with puffed wild rice, crispy lentils and coconut vinaigrette, and Persian cucumbers with persimmon, or rosewater labneh and parsley seed za’atar. how do you like these roasted beets marinated with cocoa and clove making friends with sunchoke cream, puffed buckwheat & jicama??? At Granger & Co. of London, one of the most popular menu items is the Fresh Aussie, billed as chef Bill Granger’s version of the Japanese breakfast salad; it’s made with tea-smoked salmon, avocado, poached egg, tomato, and kale. According to Technomic’s 2017 Breakfast Consumer Trends Report, 26% of diners are looking for some international flair in their breakfast menu options. At Los Angeles’ République, diners can savor flavors from the four corners of the world all before noon. From their Maine Lobster omelette to their Shakshouka – a traditional North African dish made of eggs poached in a sauce of tomatoes, chili peppers, and garlic, spiced with cumin, paprika, cayenne pepper, and nutmeg – to their LatinX inspired Pupusas and Chorizo Sopes, guests can take their tastebuds on a trip for a fraction of the price of a plane ticket. Incorporating savory breakfast ideas on your restaurant's breakfast menu may cause guests to double check their watches, but it also gives them something unique to remember you by. Be sure to subscribe to The Toast Restaurant Management Blog for fresh restaurant industry insights delivered straight to your inbox daily.